Tin, 8 x 7 in. Pochoir, 16 Â½ x 25 5/8 in. From the collection of Mr. Robert Weintraub Â© 2010 Succession H. Matisse / Artists Rights Society (ARS), New York Photo Credit: âThe Circusâ from the illustrated book âJazzâ by Henri Matisse, 1947. 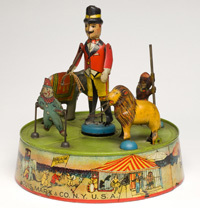 The delight and wonder of the circus comes to the Bruce Museum in a major, new exhibition organized by the Bruce Museum. Circus! Art and Science Under the Big Top illuminates the pageantry and feats of skill and daring of this spectacular form of public entertainment and its evolution from the 18th century to the modern day. The exhibition features over 65 objects, many on loan from institutions throughout the country. These include authentic swallowing swords and costumes, colorful circus posters, historic photographs, and exquisite fine artworks by world renowned artists such as Henri Matisse and Marc Chagall. Also included are several interactive stations demonstrating the science and mechanics behind performing acts that seem to fly through the air or require impossible balance. An audio cell-phone tour will also be available in the galleries. The exhibition is sponsored by Moffly Media and supported by a Committee of Honor co-chaired by Susan Mahoney and Linda Chase-Jenkins and by the Charles M. and Deborah G. Royce Exhibition Fund. Circus! Art and Science Under the Big Top opens with an exploration of circus history. The exhibition highlights historical posters, broadsides, photographs, and performance objects dating back to the first years of the circus in the United States in the early 19th century. In 1770, the English performer Phillip Astley constructed a ring so that performers on horseback could present their tricks continuously, rather than riding in a straight line. The modern circus quickly gained popularity as shows opened across Europe and first arrived in the United States in 1793. The dawn of the railroad and the Industrial Revolution in the United States iin the late 1800s and early 1900s drastically changed the scope of the circus. Shows could travel to more areas of the country, and audiences could come from farther distances. Operations became so efficient that the US Army studied traveling circuses. This new, profitable mode of entertainment attracted great entrepreneurs and businessmen such as P.T. Barnum and James Bailey. 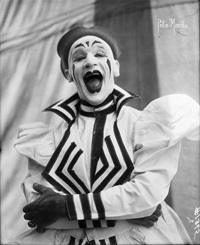 However, by the 1950s the popularity of the circus waned and attendance dropped as audiences discovered other forms of entertainment in radio, movies, and television. Meanwhile, the colorful and theatrical world of the circus has continually sparked the creative energies of countless artists from Europe and America over the past two centuries. A second secoction of the exhibition showcases prints and paintings illustrating the personalities and vitality of the circus. These include works by artists of the Impressionist generation such as James Tissot and Henri de Toulouse-Lautrec who were captivated by the beauty and allure of the European circus. As the circus reached its heyday in America, the Ashcan School artists and their followers such as Everett Shinn and John Steuart Curry gravitated toward the subject in their quest to capture scenes of everyday life. Early modernists such as Alexander Calder, Henri Matisse, and Marc Chagall exploited the dynamic forms and colors of the circus as they moved towards abstraction. Diane Arbus and other contemporary photographers have continued to depict the circus in increasingly innovative and evocative ways. The final section of the exhibition will reveal the mechanics and physics behind many of the performances associated with the circus. An x-ray of a performing sword swallower underscores the importance of a keen understanding of anatomy. Museum visitors can learn about the momentum, friction, and force that trapeze artists experience as they fly through the air. Young visitors can ride a movable circus horse. Circus! Art and Science Under the Big Top is curated by Bruce Museum Education Department members Caroline Shields and Diane Myers. Lending institutions to the exhibition include the Addison Gallery of American Art, the Big Apple Circus, The Barnum Museum, the Frick Art Reference Library of the Frick Collection, Galerie d’Orsay, the National Gallery of Art, The John and Mable Ringling Museum of Art, the San Antonio Museum of Art, the Somers Historical Society, The Westmoreland Museum of American Art, the Wisconsin Historical Society, and the Yale University Art Gallery. Additional works were selected from galleries, private collections, and the Bruce Museum Collection. Click here for special events and programs complementing Circus! Art and Science Under the Big Top. For more images from the exhibition Circus! Art and Science Under the Big Top, click here.